As another review noted, this is more seaglass green than aqua so it doesn't go with the aquas in my room. However, I love the leaf design and coverlet weight so I'm using the white side with the barely visible light green stitching. 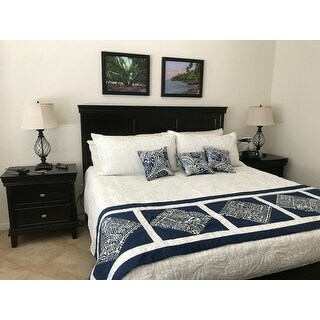 The Madison Park Cambay 3 Piece Reversible Quilted Coverlet Set introduces a refreshing coastal look to your bedroom decor. The reversible coverlet and shams flaunt a palm quilting pattern on the face and reverse, adding a rich texture to the bedding set. Fully reversible, the top of the bed displays a stunning white hue that can be flipped to a beautiful aqua for a one-of-a-kind look. The two reversible shams feature a hidden zipper to help keep your pillows secure. Made from ultra-soft microfiber, this reversible quilted coverlet set easily transforms your bedroom into a relaxing getaway. I was looking for a lighter weight comforter for our home in Palm Desert. I purchased the aqua. I don't really care for the aqua side which is really more seafoam green but since I but actually wanted it for the reverse side which is white with very subtle aqua stitching of the Monstera leaf design it just what I was looking for to go with a Hawaiian bedrunner. Mainly because of the three reviews. The size seems normal for a King & hopefully the color will work. The sale price made the decision over others in that color range.